A 68 year-old woman with Crohn’s Disease presented to the emergency room with a 2-month history of fever and nausea. Examination revealed fever with epigastric and right lower quadrant tenderness to palpation. Medications on admission were azathioprine, oral budesonide, cetirizine, and acetaminophen as needed. Laboratory tests were significant for AST 290 U/L (ref. range 10-40 U/L), ALT 110 U/L (ref. range 7-56 U/L), total bilirubin 2.4 mg/dL (ref. range 0.3-1.9 mg/dL), and alkaline phosphatase 1050 U/L (ref. range 44-147 U/L). Serologies for Hepatitis A, B, and C were negative and autoimmune assays were unremarkable. Magnetic resonance cholangiopancreatography (MRCP) and contrasted computed tomography (CT) of the abdomen were unrevealing. Upper endoscopy with biopsies revealed inflammation of the distal duodenum with crypt apoptotic bodies by histologic analysis (Figure 1). No viral cytopathic effect was noted. Colonoscopy was unable to be completed due to inability to tolerate colonoscopy prep. Liver biopsy showed bile duct drop-out with background steatosis and bridging fibrosis. 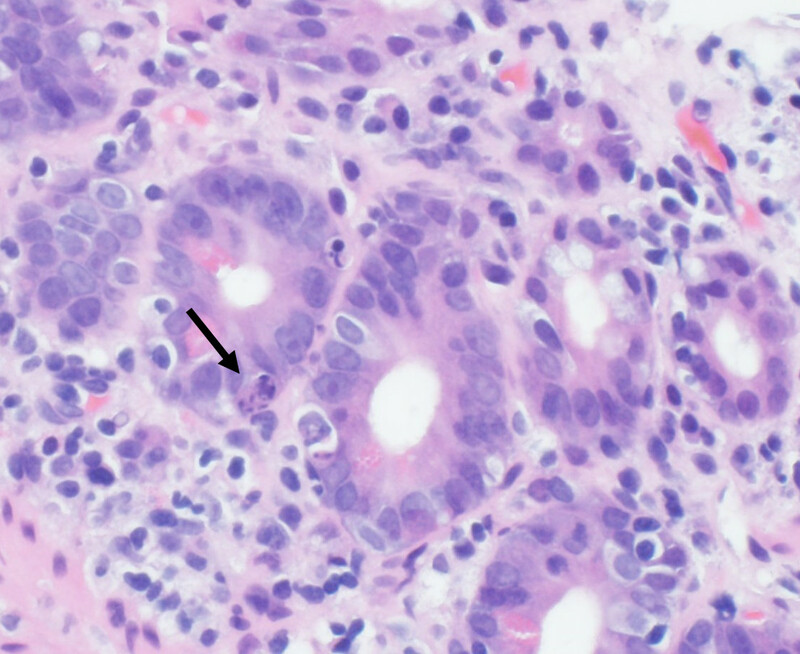 A viral cytopathic effect was noted (Figure 2), and immunohistochemistry staining on both hepatic and duodenal biopsies was subsequently positive for cytomegalovirus (CMV). After a two-week course of antivirals, the patient’s symptoms and laboratory abnormalities resolved. MCQ1: Diagnosis of CMV is best made by which of the following methods? MCQ2: CMV can cause gastrointestinal disease in which populations? Thomas D. Filardo is a 2nd year resident in the Internal Medicine Department at the University of Colorado.